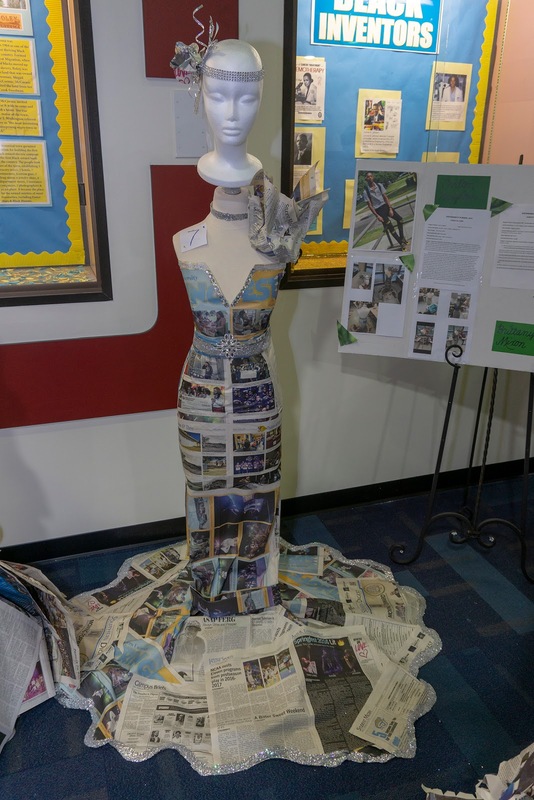 Newspaper wedding dresses designed by students in the Apparel Merchandising and Textiles concentration will be displayed in the lobby of Southern University's John B. Cade Library until March 2019. Baton Rouge, La. – Southern University Apparel Merchandising and Textiles (AMTX) students have designed beautiful wedding dresses with newspaper as the fabric. The floor length dresses, along with newspaper headpieces, were a part of a project in the Sustainability in Design class. The project was meant to “stretch the students’ talent, skills and abilities as a designer,” according to the project assignment provided to the students. The newspaper wedding gowns are currently displayed in the lobby of Southern University’s John B. Cade Library. The exhibit will run until March. AMTX is one of three concentrations offered in the Department of Family and Consumer Sciences within the College of Agricultural, Family and Consumer Sciences. For more information about the department, visit http://www.subr.edu/subhome/42. Click here to view photos of the newspaper wedding dresses.